SANAA, Yemen - Al Qaeda's Yemen branch routed government forces from a large weapons depot in the country's east on Friday, seizing dozens of tanks, Katyusha rocket launchers and small arms, security officials said, as airstrikes by a Saudi-led coalition intensified in the capital, Sanaa, and also in Yemen's second-largest city. The seized depot is located in Mukalla, the capital of Hadramawt - Yemen's largest province where al-Qaeda has been consolidating its control. Only the day before, the militants captured a major airport, an oil terminal and the area's main military base. The gains highlight how al Qaeda has exploited the chaos in Yemen, where Shiite rebels are battling forces loyal to exiled President Abed Rabbo Mansour Hadi. The Saudi-led air campaign in support of Hadi, now in its fourth week, has so far failed to halt the rebels' advance. Al Qaeda in the Arabian Peninsula (AQAP), as the Yemeni affiliate is known, is widely seen as the global network's most dangerous franchise and has been linked to several failed attacks on the U.S. The group claimed responsibility for the attack on a French satirical magazine in Paris earlier this year. However, the Saudi-led air campaign has not targeted areas with an al Qaeda presence, including Hadramawt, where the militant group has long been implanted despite U.S. drone strikes and Yemeni counterterrorism operations. 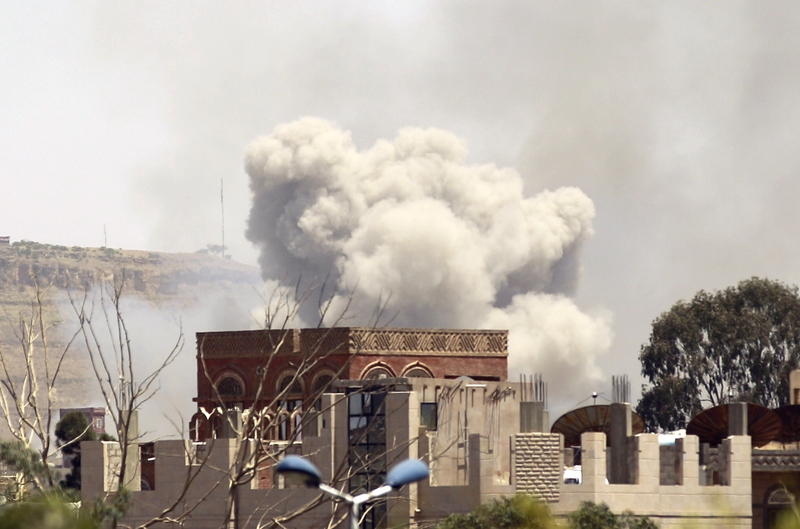 The coalition says the airstrikes are aimed at the rebels, known as Houthis, not al Qaeda. Pro-Hadi forces gained some ground elsewhere in Hadramawt on Friday, with fighters capturing the province's Masila oilfield, the country's largest, commander Ahmed Bammas said over the telephone. On the other side of the country, Saudi-led coalition airstrikes targeting the rebels intensified, with bombings in Sanaa and also Taiz, the country's second-largest city. The levels of the bombings were their most intense levels since the campaign started on March 26, the security officials said. Thick plumes of smoke rose high above Sanaa as weapons stores in mountains overlooking the city exploded and burned, while local residents continued to flee the violence, said the officials. In Taiz, the rebels clashed with army units loyal to Hadi, with tanks and heavy machine guns firing throughout the day and airstrikes hitting a military base of the Houthi-allied Republican Guard, the officials said. Airstrikes also continued in Saada, the Houthis' northern stronghold, and Aden, the southern port city that the rebels have been trying to take for weeks, in cooperation with forces loyal to former President Ali Abdullah Saleh, they added, speaking on condition of anonymity because they were not authorized to talk to reporters. Meanwhile, the United Nations urged the international community to provide $274 million in aid to help save lives and protect some 7.5 million people affected by Yemen's conflict. In a statement, the U.N. said that along with its partners in Yemen, it needed the funds to purchase medical supplies, safe drinking water, food assistance, emergency shelter and to provide logistical support. Fighting between the rebels and forces loyal to Hadi intensified in March, with the Saudi-led coalition of major Sunni countries in the region launching the airstrikes on March 26. The Office for the Coordination of Humanitarian affairs says that the turmoil has killed hundreds of people and displaced at least 150,000. UNHCR says shelter is emerging as a pressing humanitarian need in the country.